Designing Around a Curvy Path. In our neighborhood many old houses are torn down and the lot is split in two. They put up very roomy period style homes like this one. We have alleys so the garage is at the back of the property separated from the house by a smallish plot of grass. 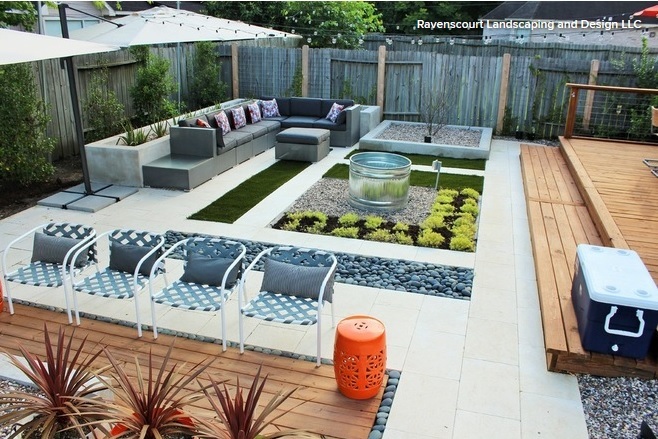 This young couple wanted more space for entertaining and a garden with more visual appeal. They also wanted it to be easy to take care of. 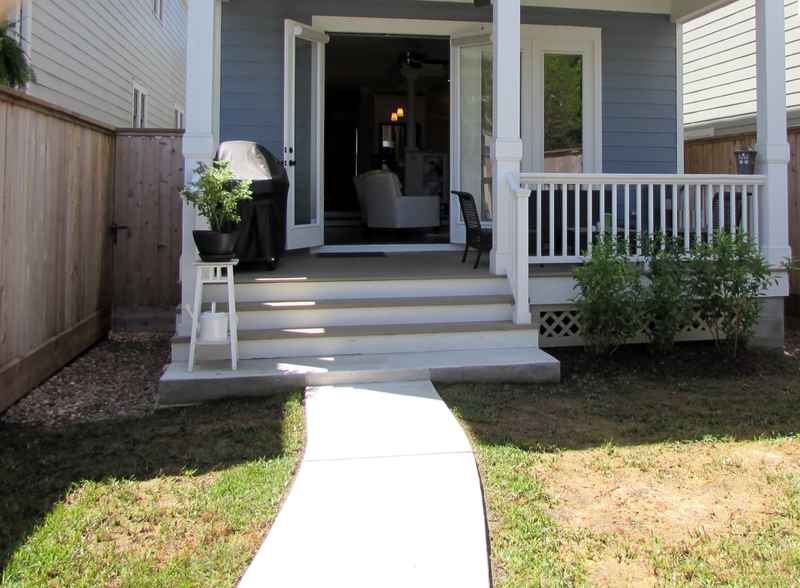 Here is the before: a nice porch with a row of Night Blooming Jasmine. Here is the before looking towards the garage. As you can see the lawn isn’t doing very well in the shade of the house. The desire was for modern clean lines that also went with the cottage look of the home. I decided to put a patio out away from the porch and flank it with green walls. 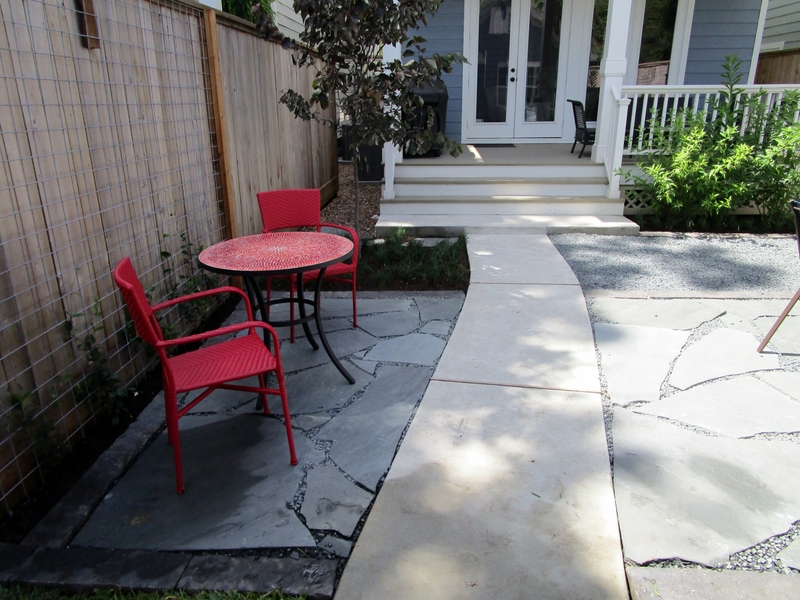 I usually think of man made pavers or cement pads for a modern look. But, I didn’t like the idea of a curving path through very straight material. 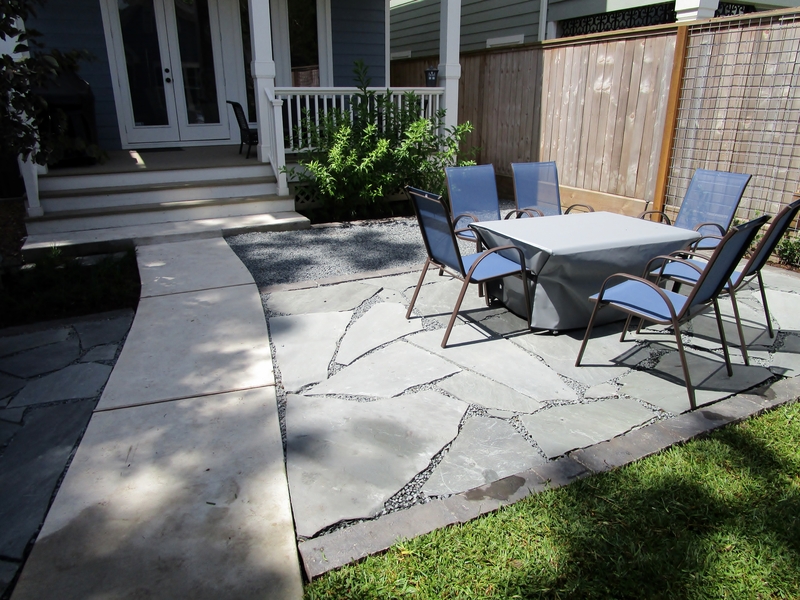 So I decided to use flagstone in a cool gray blue. I like the idea of getting out into the garden and here it worked well even though it meant very little lawn left for the dog. 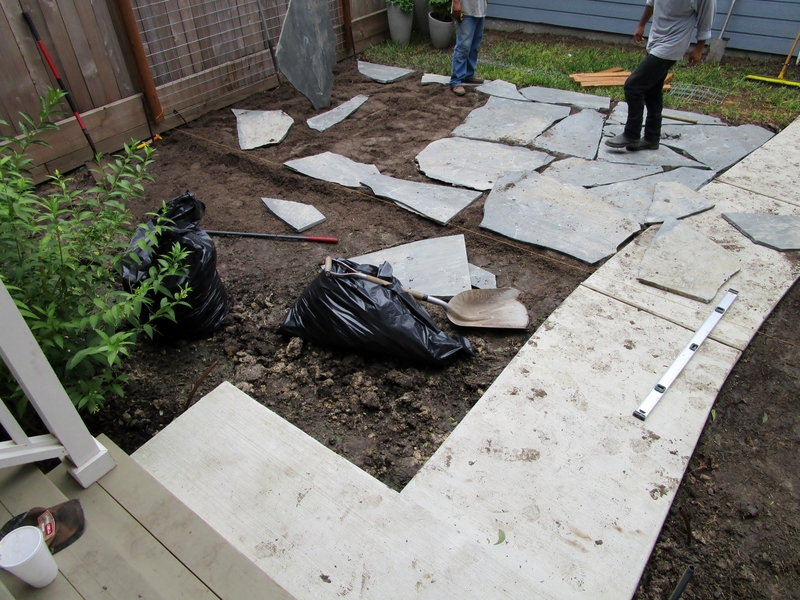 After stripping the grass and putting in piping for irrigation it was time to lay the flagstone. It is much like putting together a puzzle. The name of this stone is Pennsylvania Blue Select. We are setting it into the compacted native soil. 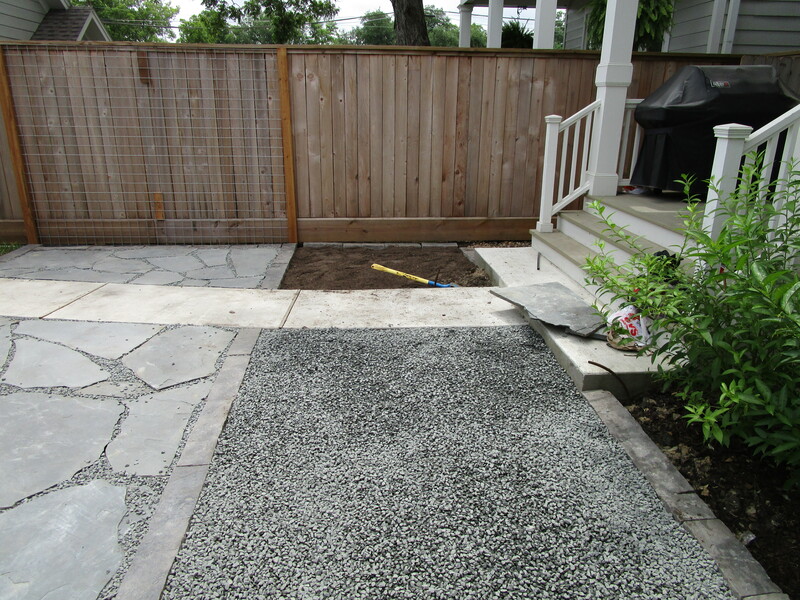 It will be locked with gravel and a chop stone border. In the picture below you can see that the welded wire panels are up and the beds are prepped for planting. I used Star Jasmine because it will form a solid evergreen wall, and is happy in our climate year round. Above in the lower left corner is where I planned a place for a fountain. The couple decided against it at this point. We can always add one at later date. Below you see a big swath of gravel. It has several functions. 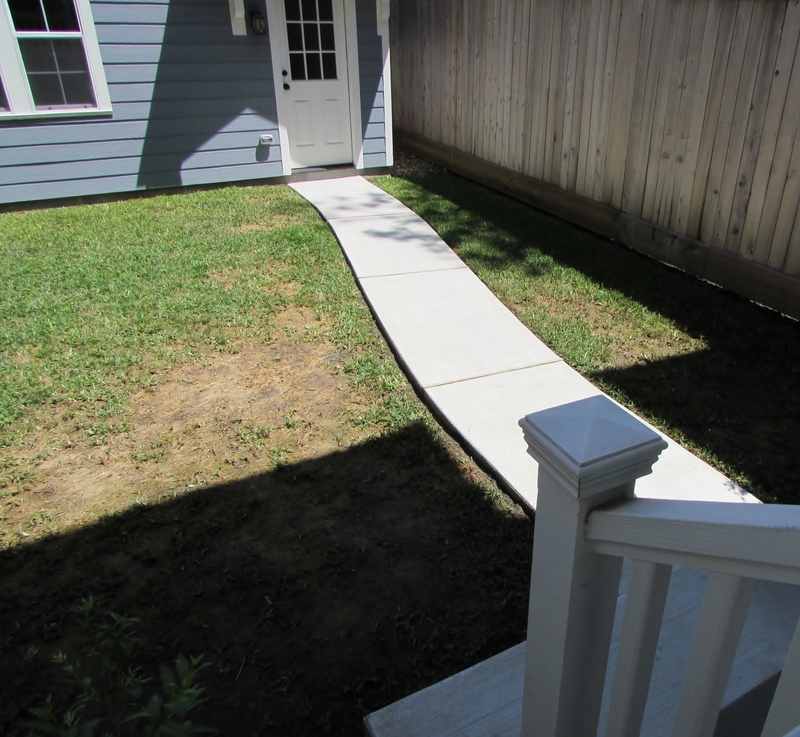 It is the path to the side of the house and it is room to spread out in a large gathering as well as helps divert excess rainfall, unobtrusively, to a nearby drainbox. If you check the design I had a fire pit half in the patio, half in the gravel. They opted for a movable one. And that changed when they actually found a very cool fire dining table. It is important to get all the surfaces level with each other to minimize trip hazards. 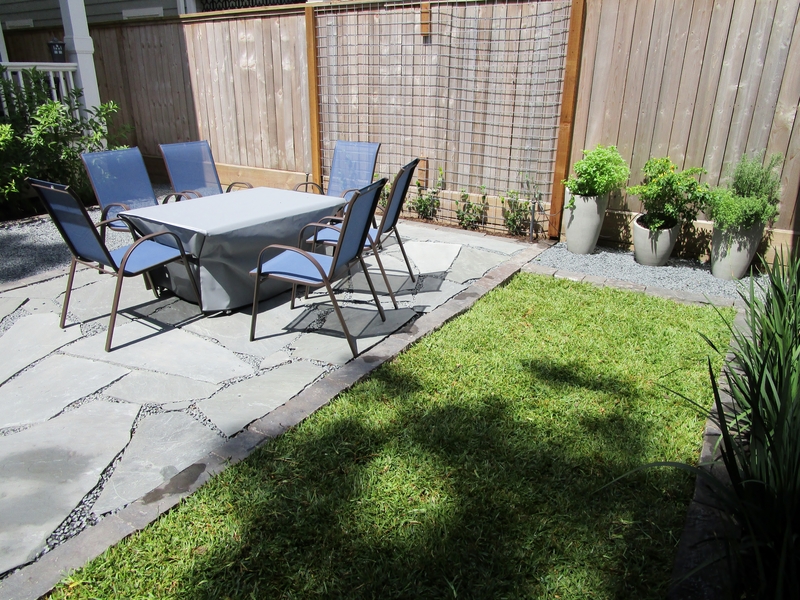 Even though we took out 2/3’s of the lawn the entire space remains water permeable. 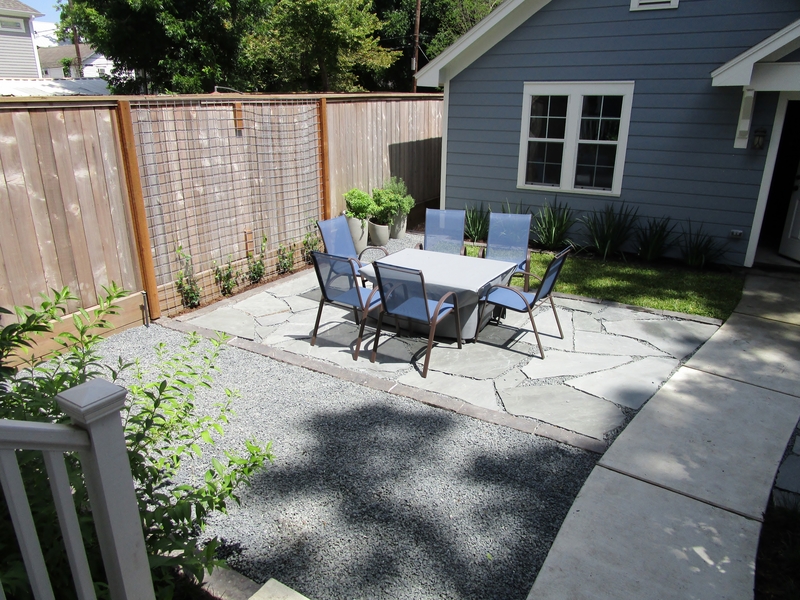 I prefer flagstone patios edged with chop stone borders. I like the look of the strong east west line breaking up the garden that is long going north south. Here it also works well to help achieve the simple modern look we are going for. On the little space to the right of the curved walk I suggested a little cafe table and chairs. A nice place for a private conversation or a bit of morning shade. I love the red set they chose! The tree in the foreground is a Forest Pansy Redbud. They are wonderful for year round interest and light and airy enough not to overwhelm the space. 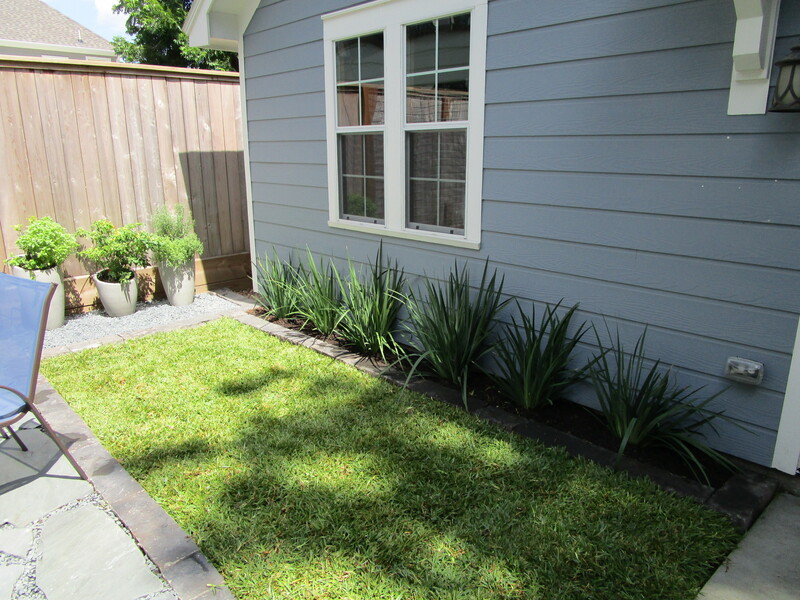 Along the garage we planted African Iris,Dietes iridioides. 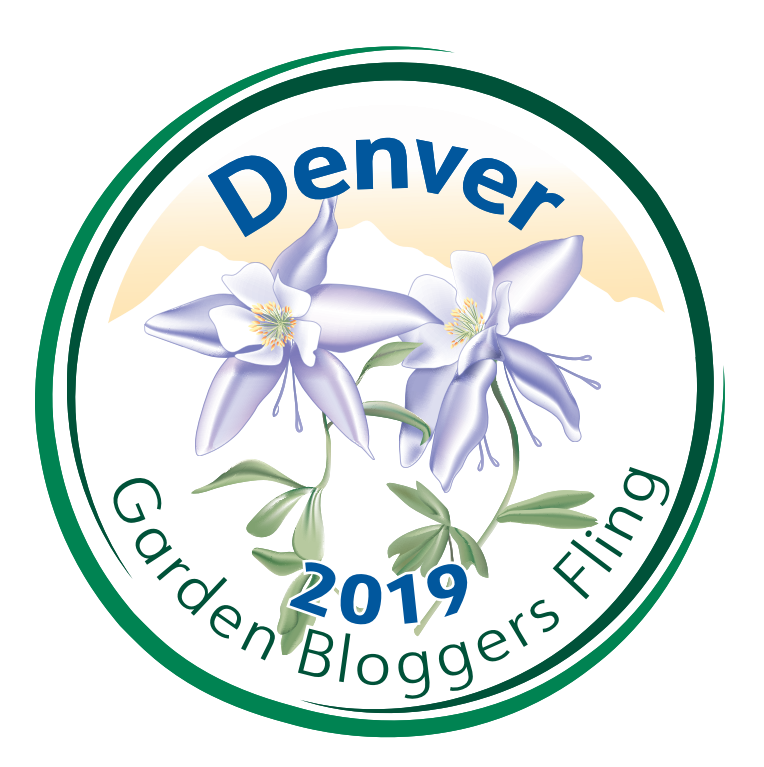 I had thought bi-color iris originally and then realized that if I switched to African Iris it would be an all white blooming garden except when the redbud blooms. 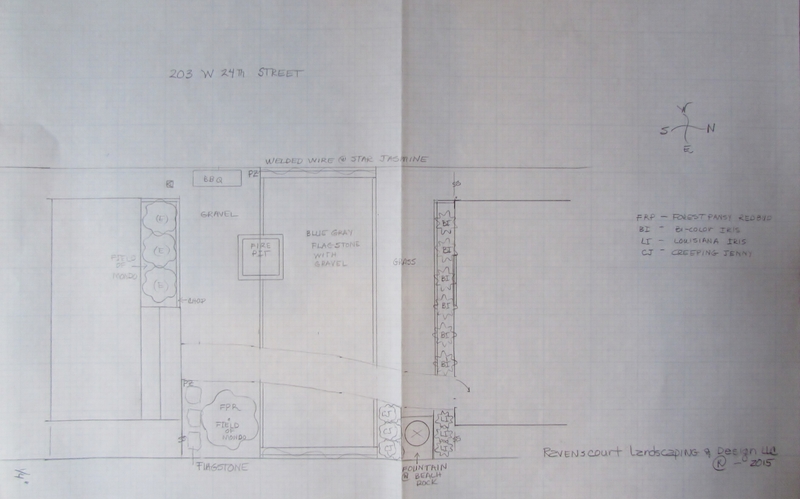 During the designing phase we talked about a raised herb garden instead of the fountain. To take advantage of the cooler morning sun and to leave the access to the alley clear we moved it to the west side of the yard. 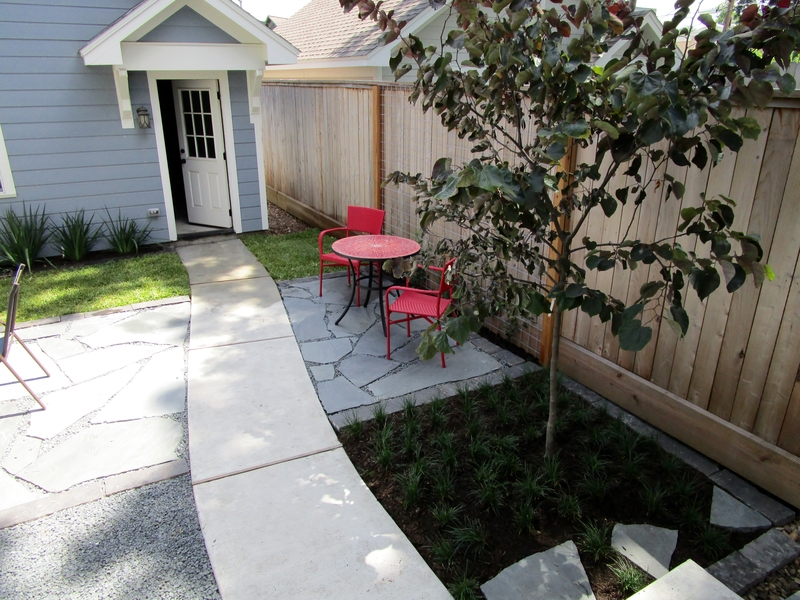 I like that they went with gray pots which goe with all the other hardscape materials. These post are watered with a dedicated pot zone as part of the automatic irrigation system. Here is a view back towards the house. I can’t wait to see it with the vines grown up and defining the patio further. Not a lot of plantings but once they all grow in I believe it will be just right. Here is the fire table uncovered. Looks like a very fun place to enjoy an evening meal. I am sure even more fun on one of our lovely fall or winter evenings! Lit up, a bit hard to see but imagine in the evening! I will have to ask for some evening shots. And it looks like a few more herb pots have been added. Much more functional than a lawn. Does this feel inviting to you? It would be had to make plant selections in your area with the weather always so volatile in extremes. Small landscaping is hard to come up with something original and I think you did. Finding a design that made that curving path look good must have been a challenge — not enough space to really curve, and just enough curve to look crooked. 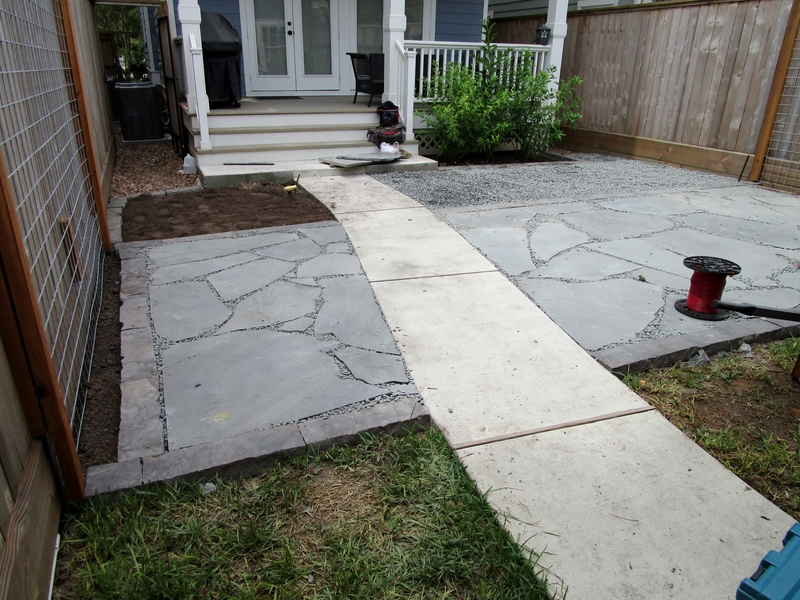 Choosing the Pennsylvania bluestone did the job perfectly, especially using the large pieces and extending it on both sides of the path. The finished project suits the house and the owners’ desires.It looks great! This does feel inviting. Very much a transition from the work world to a feelling of safety, enclosure and “I am home.” It is used everywhere but I love the evergreen jasmine for so many reasons. I think it must be a bit frustrating for garden designers though. Whenever I read descriptions of how much energy homeowners want to put in their garden they always say they want something easy to care for — so easy they don’t have to actually do anything. 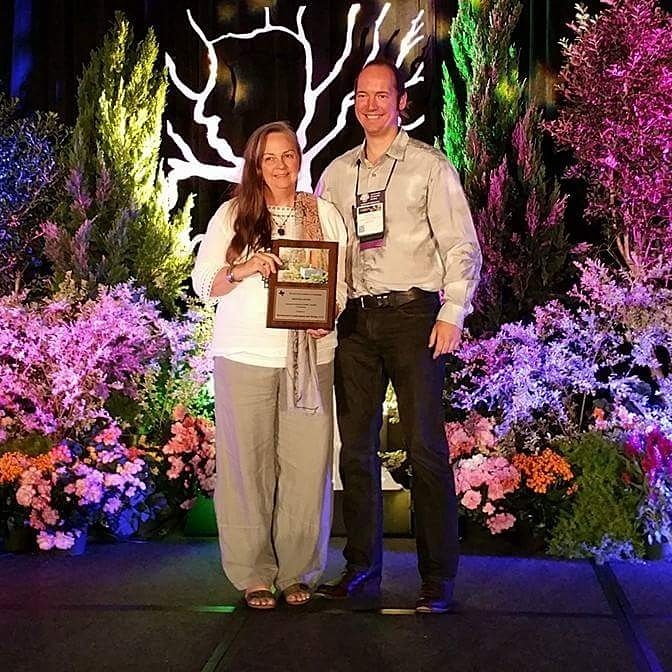 Wouldn’t it be a dream to run into a project where the person said: I love gardening; make it a place where I can go out every day just to be with the plants. Wow, from blah to serene in one fell swoop. 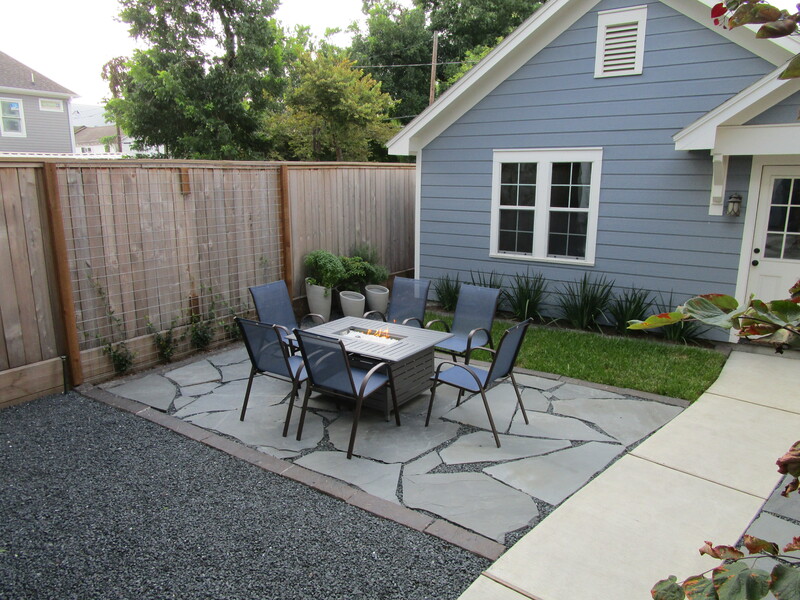 I’m assuming the gravel area is for negative space, just not lawn, and that can allow for another table? 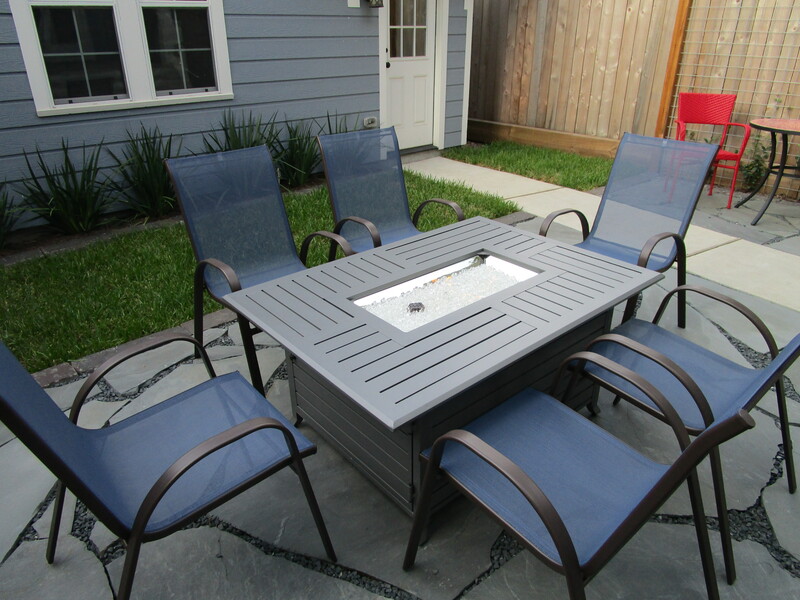 Picking out furnishings – never have had luck doing that with clients – glad they worked with you even a little on that. Thank you Julie : ) It suits the couple and the flow of their style inside to outside! This is absolutely charming! Easy to care for, functional, pretty, and graceful. Love your before and after views.